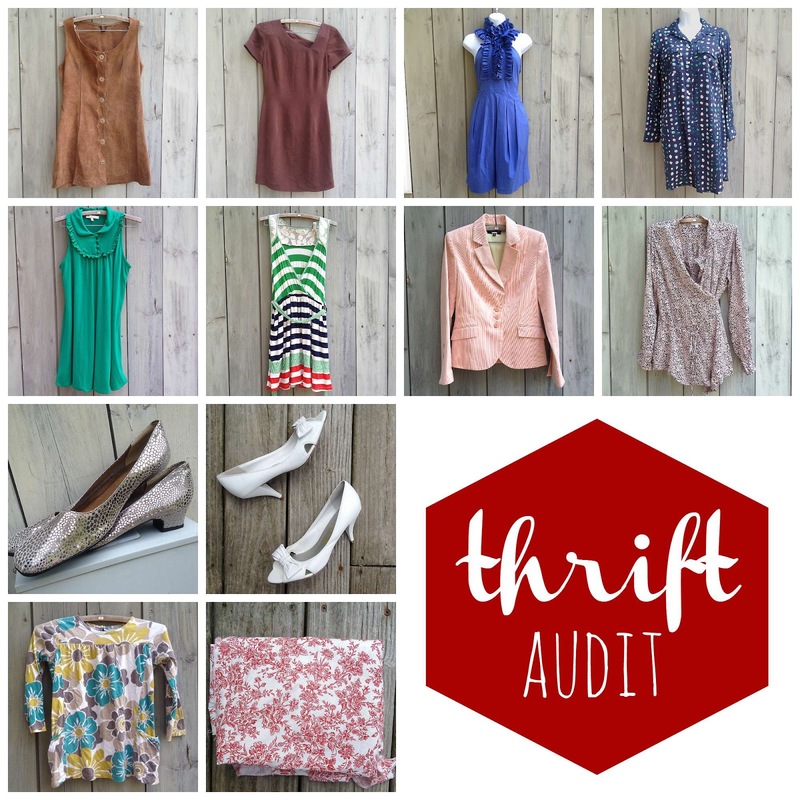 Fall rummage sale season is upon us, and my closet is bursting at the seams! I'm actually considering a buying freeze after the next few weeks — I feel like I have enough back stock to keep my Etsy shop afloat for months as it is. I was feeling kind of bummed out about this rummage sale, but when I actually put it all together, I can see that I got some good stuff. Sometimes the vibe of a certain sale can just put me in a pessimistic mood. This dress is not in terrific shape — there are a few stains here and there — but at this price, I couldn't resist. Another keeper for the spring/summer consignment stash. Absolutely lovely, buttery silk, and I love the asymmetrical neckline. Isn't this a pretty color? I feel like on the right person, this would be a stunner. I love the topstitching detail at the waistband, too. There is some slight weirdness around the neckline, like someone did a small alteration? But I feel like the ruffles almost completely cover it, so I'm hoping it's not a problem. I was too lazy to belt this, but it would look pretty cute that way! I took this to consignment, and I'm hoping it will sell, although it's pretty lightweight for fall/winter. Good or bad buy: Good buy? I hope it doesn't end up in the clearance section. I bought this intending to sell it, BUT I had just been thinking about how I don't have much green in my wardrobe, and this fits me. Plus it has a bib front, which I love. I'll try it out, and I can always sell it in the spring if it doesn't work out. Good or bad buy: Good buy, I suppose — I won't get much for it on consignment, but if I can wear it a few times in the meantime, I don't mind. I LOVE the color palette and the print pattern of this dress. The "white" is really an off-white/oatmeal color. Good or bad buy: Good buy, I hope — it's not high-end, but it sure is pretty. Keep or sell: Sell - ? I rushed this blazer off to the consignment store, but they rejected it :( I may try a different shop, but I'm bummed. It's gorgeous! Good or bad buy: Bad buy, apparently? This pretty lightweight top is headed to consignment — pretty maternity clothes seem to sell well. I'm not sure whether they will consider this "winter" (because long sleeves) or "spring/summer" (because it's lightweight) so I'll try it now and see. These are already at consignment! The soles are completely unmarked, and I mean, come on — who wouldn't want to buy these? Good or bad buy: Good buy, I hope — they are a larger size, so I'm not sure if they will sell. These shoes are totally adorable! I will hold on to them until spring before I list them, because, y'know, white shoes. Total hoarder territory here. This won't fit my daughter for literally YEARS, but I couldn't resist the print, and the side pockets. Good or bad buy: Good buy? Hard to say. This is sort of a weird remnant/scrap, not straight yardage, and there's not a ton of it, so I'm thinking little girl dress? Or possibly combining it with some solid red fabric in my stash. Anyway, I LOVE the print and only wish there was more of it. Some missteps here. (I'm still mad about that orange blazer!) I feel like I was trying to "get my money's worth" at the bag sale, and wound up buying a few things that weren't the best — there's a lot of "if"s and "maybe"s. As always, if you see anything you like, feel free to make me an offer or ask for more info!